I am highly honoured and humbled with your kind hearted gesture of supporting the needy people in Kenya suffering from Diabetes especially children (Type 1 diabetes). With your kind support, I believe we are going to help needy Kenyan's with the supply of insulin for a life line program. Diabetes Kenya Lifeline is the joint project between Diabetes Kenya Association and International Diabetes Aid Fund Japan and we perform the works collaboratively below. (1)Support the people with diabetes who cannot afford to take the proper care for a while so that they can lead the healthy life in Kenya. (2) Instruct the people with diabetes and their families the cause and the care of diabetes correctly. The project is directed by the steering committee of Diabetes Kenya Lifeline in the Diabetes Kenya. The member of steering committee could be chosen from International Diabetes Aid Fund Japan. The number of the steering committee member must be less than 12 and one of them is appointed as the chief steering committee and the secretary-general respectively. 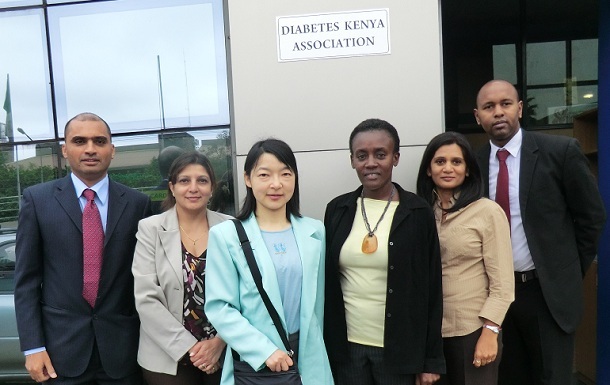 Both should be chosen by the negotiation between Diabetes Kenya Association and International Diabetes Aid Fund Japan. The tenure of the steering committee members should be two years but could be reappointed. The new appointment should be chosen by the negotiation between the chief steering committee and the secretary-general. The steering committee must manage the account of treasury from International Diabetes Aid Fund Japan so that it must be used the treasury along the aim of the project. Use the web-page of International Diabetes Aid Fund Japan and other ways and address the charity and sponsors. The committee of Diabetes Kenya Lifeline must report the annual activity within the two months from the finish of the annual year to the secretary-general of International Diabetes Aid Fund Japan every year. The International Diabetes Aid Fund Japan can use it on the web-page and as the report for sponsors. The fiscal year of the project begins on July 1st and ends on June 30th every year. Diabetes Kenya Association and International Diabetes Aid Fund Japan can dissolve the joint project and collaboration by paper notification three months in advance. This code puts into effect April 2012.